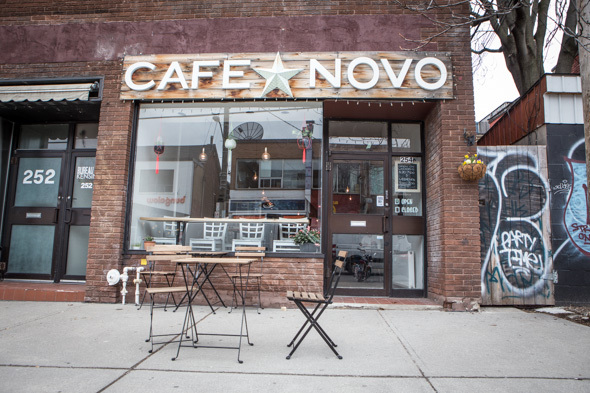 Cafe Novo in Kensington Market is the latest home of the former High Park hangout . 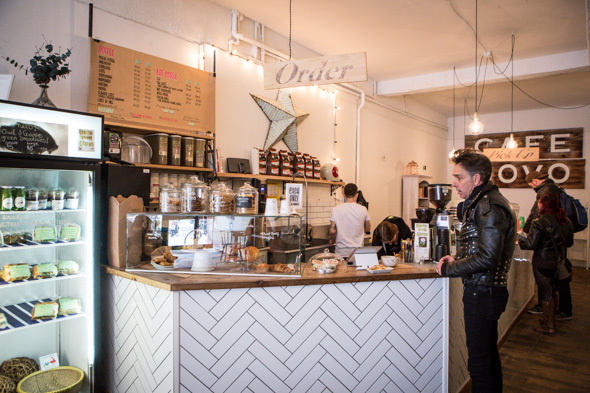 After occupying the same quaint, cozy spot above High Park station for five years, Elizabeth and Alex Wimbush say their rent almost doubled overnight, forcing the siblings to pack up their espresso machine and seek their fortune elsewhere. Understandably, after building up a customer base over half a decade, they were loathe to leave. "We were settled. We had a neighbourhood spot," Elizabeth says. ("We had people!" Alex interjects.) After a search, it became clear that the area had no suitable spaces that weren't already next door to an existing cafe. They ended up on Augusta, in the former home of The Comic Pile , and spent a month and a half scrubbing the last traces of the "comic book chic" interior from the walls, knocking down the ceiling tiles to reveal an extra couple feet of height. The finished product is a soothing, spacious shop hazily lit by large front windows - a pocket of calm in the chaos of the market. 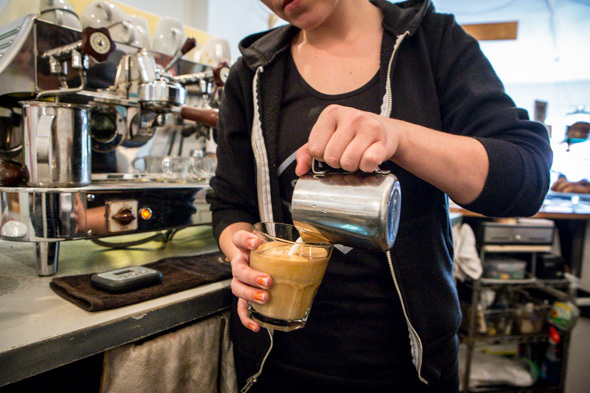 Of course, this neighbourhood has no shortage of cafes itself - Cafe Pamenar and Rick's are across the street, Jimmy's and I Deal are tucked into side streets nearby, Fika and Moonbean await further south - but Elizabeth is confident that there's enough room for everyone. "Every cafe has its own crowd, know what I mean? People who live in the area, people who work in the area, straight-up tourists. 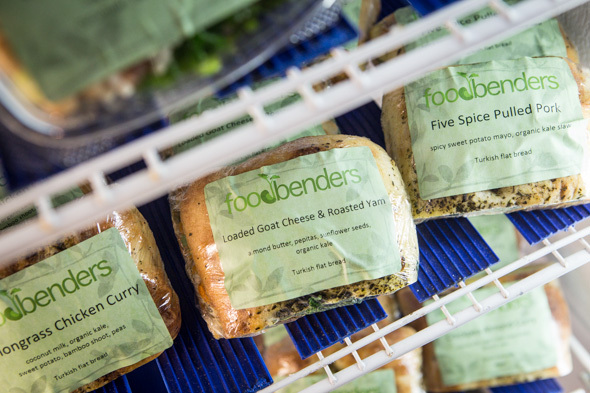 I feel like there's a demand for more space, more tables, kind of a chiller hangout vibe." 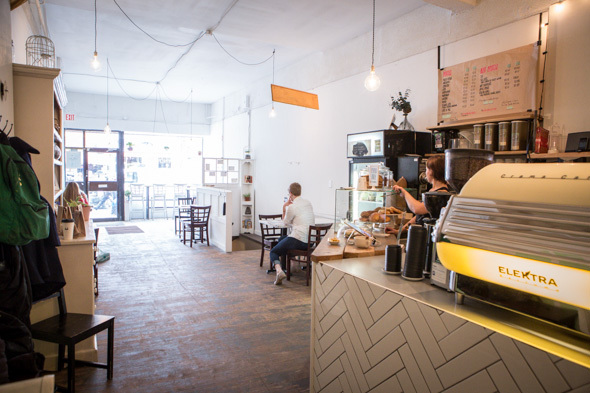 Toward the back of the shop is the service counter, where a stately Elektra Barlume machine kicks out espresso drinks with Rufino Incontri beans and super-rich Harmony milk. 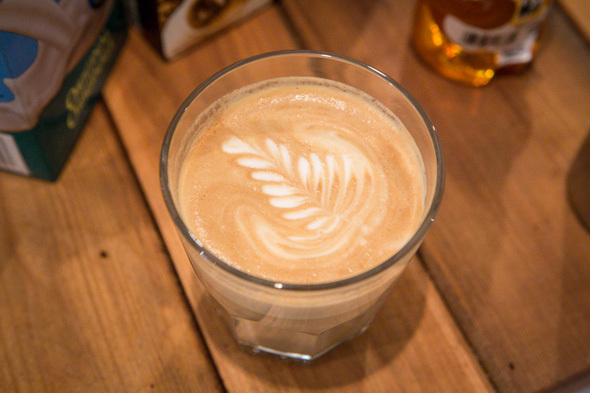 Feel like skipping the espresso? They also do press coffee ($2.10 small, $2.55 large) with rotating selections from Guelph's Planet Bean , which they also sell in bags. 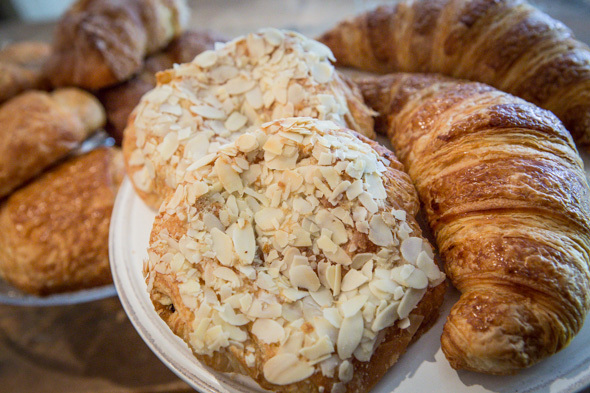 The pastry case is stocked with muffins, scones and viennoiseries from La Bamboche ($2-$3.50); on Elizabeth's recommendation, I snack on an almond croissant; on top of the almond slices sprinkled on top, there's almond cream mixed in with the dough for an extra hint of sweetness and flavour. 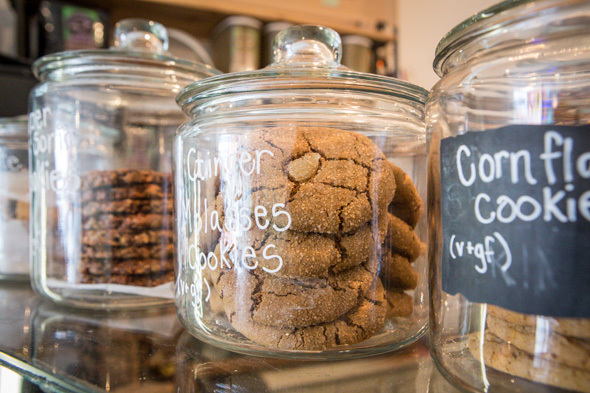 Atop the pastry case is a row of cookie jars stocked with cornflake cookies and other gluten-free treats from Bunner's , just a few doors down; shortly after opening, they were hoping to bring in Bunner's muffins as well. 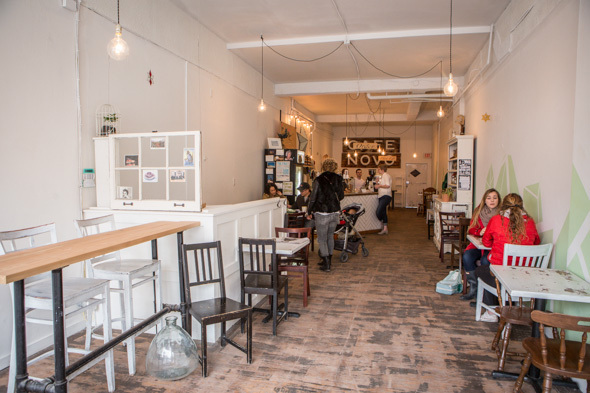 So far, the cafe has had a steady trickle of visitors - laptoppers, folks with kids, and plenty of old High Park regulars looking to say hi - but their demographics might be in for a healthy shift pretty soon. "We're trying to be tied in with the local motorcycle community," Elizabeth says. "I ride a motorcycle, I drink a lot of coffee, and it's nice to have a spot you can go to where you're not going to get, like, 'You can't park that outside!'" They're going to add a helmet rack at the front, and maybe introduce a small motorcycle discount for riders. How's that for a niche?